Mt Rainier Futbol Club (MRFC) is proud to announce a NEW division of their premier youth soccer club. The new division of MRFC will serve youth soccer players north of Enumclaw. Players will train and play in Maple Valley, Black Diamond, Ravensdale and areas adjacent to the Tahoma School District. MRFC is making this move due to demand from players and families looking for another opportunity that fits the needs of these communities. This new division of MRFC is called MRFC North. Our staff is comprised of very experienced coaches that have a long history of developing players and leading them to success. MRFC provides specialized goalkeeper training, weekly sessions dedicated to improving individual technique, agility and speed, along with twice a week team training. MRFC North plays in the US Club sanctioned Puget Sound Premier League (PSPL). We understand the last few years have been trying for local youth soccer players. We are here to provide a proven program with history you can trust. Your player will thrive, grow and have fun playing the “beautiful game”. Click on the link below listen to a podcast by MRFC DOC Luke Howells talking about MRFC North. It is time put on our RED and pack the stands to give our seniors the best send off we can! Our oldest girls from premier are wrapping up their final league games of their club careers! These girls decided they wanted to go out in style and have a 'friendly' match against our coaches! You won't want to miss this one! "AGING OUT GIRLS" vs "OUR AGING COACHES"
Our Red Out Event is a great opportunity for family, friends and others that just love soccer to come out and celebrate these players and the game we all love! Please bring canned food for the local food bank as we, as a club, always like to find a way to give back to our community through these types of events! Bring some cans and earn a raffle ticket for some great giveaways! Tickets can be purchased for more tickets as many great baskets will be offered! Easter Egg Dash for all kids and players 12 and under. Bring your baskets and dash for eggs during half time. We are excited to introduce a new, Spring 7v7 Recreational Program! This is a fun, in house league where players can meet friends, get touches on the ball and enjoy soccer with a smaller time commitment. All practices will take place at Kelley Farms in Bonney Lake on Friday evenings only. Practices will be run in our Academy of Excellence style training but traditional style training for teams will also be an option during the Friday night sessions. Games will take place on Sundays at Kelley Farms with kick off times beginning after 11:00. Save the date, Saturday April 27th for a Future's Celebration! It's been a fantastic first year with the Futures! We will have a celebration inviting all past and present Future players for an anniversary jamboree and loads of fun! Food trucks and other amazing surprises will make for a wonderful day. More info to come as the date approaches. 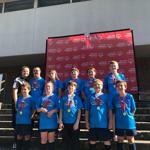 Our MRFC Unified Soccer Team Captures GOLD! Congrats United, we’re very proud of you!